"Roasted broccoli topped with lemon juice is a quick and easy side dish that only requires 5 ingredients and is a simple addition to any meal. This recipe was made in a Panasonic CIO and appears on an episode of the Dinner Spinner TV Show on The CW!" Whisk olive oil, salt, and pepper together in a bowl. Separate broccoli florets from stem. Trim and discard bottom off stem. Peel stem with a vegetable peeler or paring knife and slice cross-wise into 1/4-inch-thick pieces. Add florets and stems to oil mixture and toss to coat. Arrange broccoli mixture in a single layer on a baking sheet. Roast in the preheated oven until tender, 8 to 10 minutes. 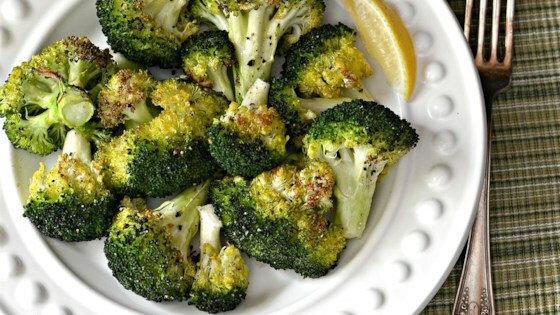 Sprinkle lemon juice over roasted broccoli. Florets are roasted with garlic in olive oil and dressed with fresh lemon juice. Really easy and a big hit at Thanksgiving. I baked for 15 min at 350° on the top rack. An excellent way to make broccoli and a perfect side to so many main dishes. Much more flavorful than steamed or sauteed. The charred bits are to die for! I cut the recipe in half. Turned out nice, great for a clean, crisp broccoli vs. the BF's favorite steamed broccoli!